Strawberries have always been one of my favorite fruits. They make me smile when I sink my teeth into their seedy flesh and a burst of sweetness fills my mouth. Plus they are packed with vitamin C and antioxidants. 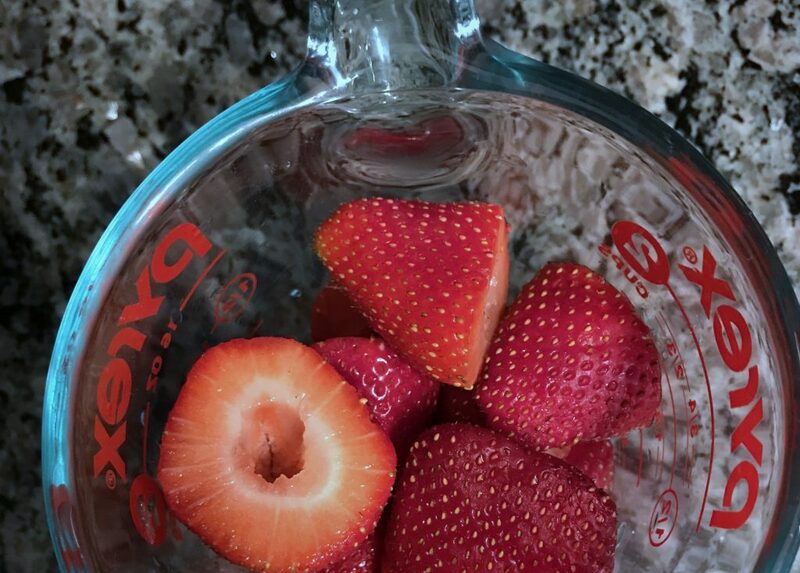 Strawberry season is the perfect time to make this fruity treat. Although you don’t need fresh strawberries to make this recipe, feel free to use frozen strawberries without thawing. These are going directly in the freezer after making. Then there’s coconut. The smell alone makes me feel like I’m on a tropical island. This multi-faceted drupe has so many uses. 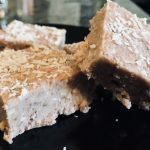 You’ll find that I used three coconut products to create my recipe: virgin coconut oil, shredded coconut, and coconut flour. 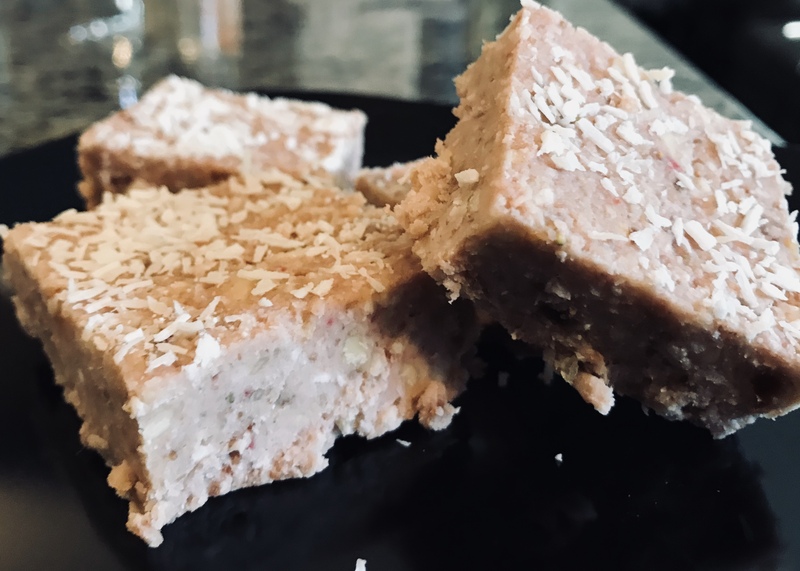 Strawberry + Coconut + Cashews (for protein and a little crunch) + Dates (for sweetness) = the not too sweet, but a little creamy, Paleo No-Bake Strawberry and Coconut Squares. They are a great little energy boost to keep you going or they make a refreshing dessert to top off dinner. 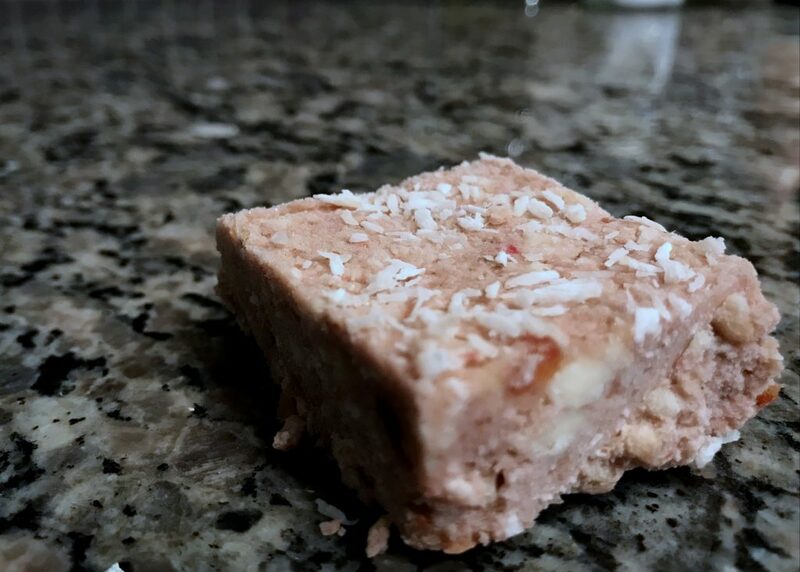 Made of wholesome ingredients and naturally sweetened, these squares make indulging your sweet tooth an easy decision. It also helps that these are simple and quick to whip up! The food processor will be doing the majority of the work. While these taste amazing by themselves, my husband and I often eat these as a dessert with a little extra. We add a handful of berries (strawberries, blueberries, and blackberries) on top, drizzle with some vanilla coconut milk, and dig in. 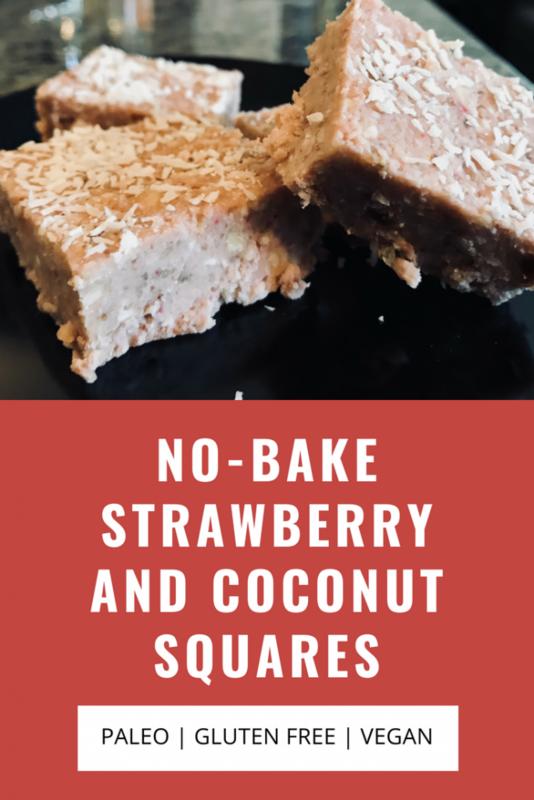 The not too sweet, but a little creamy, Paleo No-Bake Strawberry and Coconut Squares are a great little energy boost to keep you going or they make a refreshing dessert to top off dinner. Begin by hulling the strawberries. If your coconut oil is solid, melt it in a small saucepan over low heat. Once melted, take off heat. 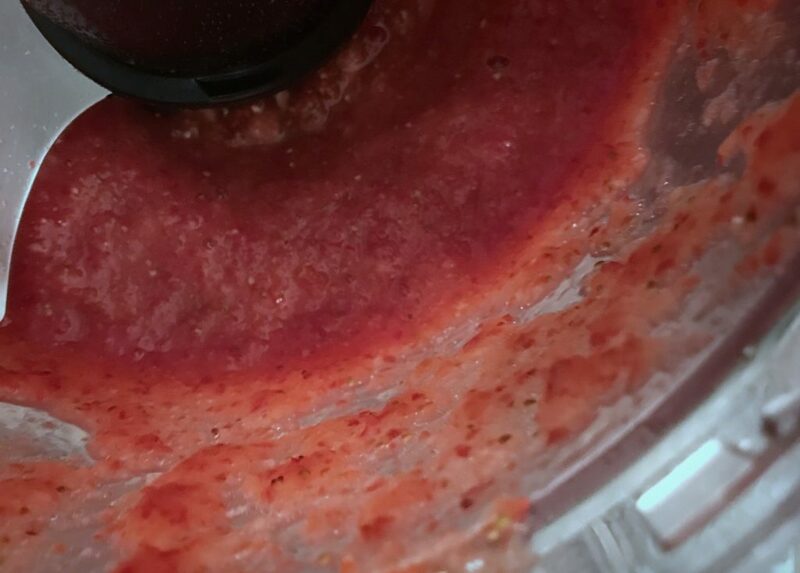 Place the hulled strawberries in food processor and blend until the strawberries are pureed (about 30 seconds). 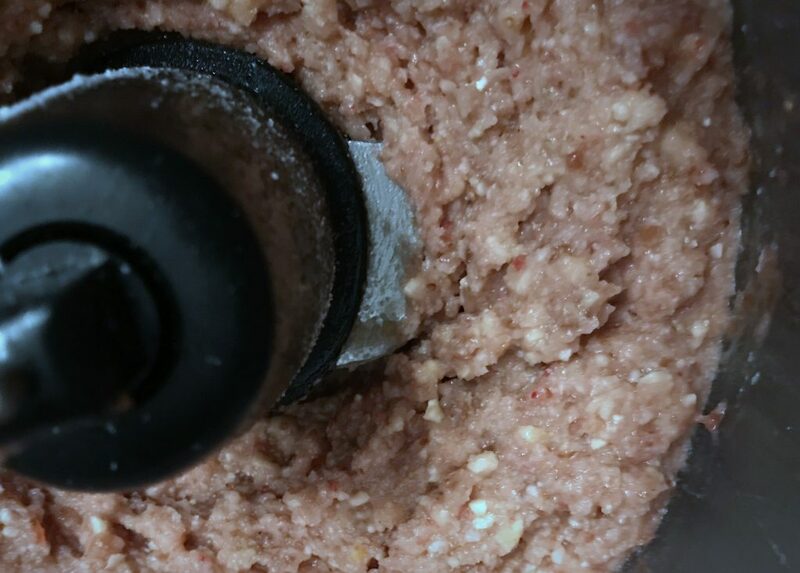 Add the pitted dates to the pureed strawberries and pulse the food processor until the dates are roughly chopped. Then blend the dates into the puree until they are mixed well (about 30 seconds). 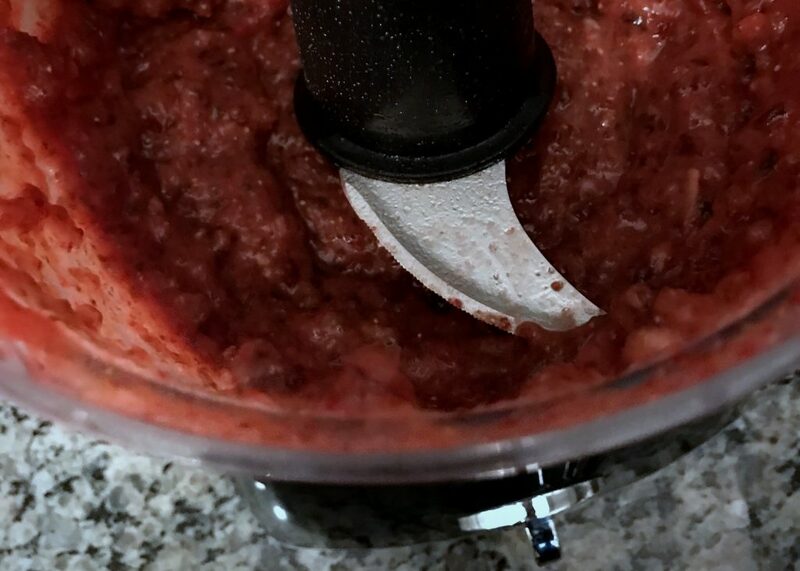 Add the remaining ingredients (coconut oil, raw cashews, shredded coconut, coconut flour), except for the shredded coconut topping, to the strawberry and date mixture in the food processor and blend until mixed well (about 30 seconds). Stop to scrape the sides with a spatula, and blend again for about 10 more seconds. Line an 8×8 pan with parchment paper. Using a spatula, spread your mixture into the pan evenly. Once your mixture is smoothed out and even, sprinkle the one tablespoon of shredded coconut on top. Lightly press it into the mixture with your spatula. Place in freezer for an hour. Remove from freezer and let sit for 5 minutes. Then cut into 16 squares. Enjoy! These are best stored in the freezer in an air-tight, freezer safe container. I usually take out a square from my container and let it set for 5 minutes before enjoying. This looks super tasty. I’ll have to try it after I go shopping next week. This recipe looks really good! Thanks for sharing! These look amazing! Perfect timing with Strawberry season. These look great! I love coconut. I use coconut milk for the chia pudding I eat every day for breakfast, and I’m pretty sure I mostly just like it because it smells like suntan oil. Wow, these sound delicious. Can’t wait to try them! 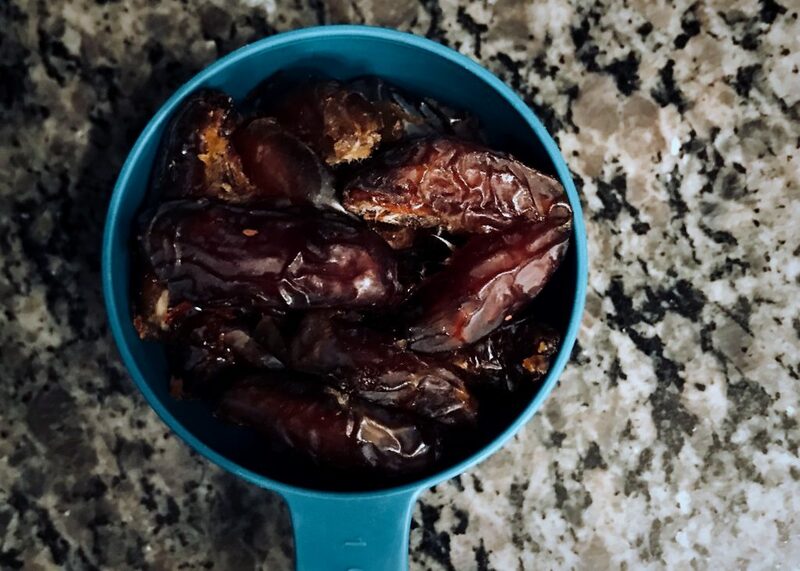 I bet I could get my kids to eat them too… they give me a hard time with fruit ‍♀️ Thanks for sharing the recipe!